Pizza Mamma is a Small traditional Italian Piaggio Ape 3 wheel truck, we have a wood burning oven that cooks fresh pizza in 2 minutes. Kids love the idea of rolling the dough, adding their favourite toppings and seeing how quick they cook. Your activity and your food is all in one with the pizza parties, so no worrying about getting for example a magician and food on top, we do it all. 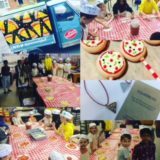 If you fancy something different and your children love pizza – get in touch. Pizza Mamma is myself and my 8 year old son (Little Assistant Reu) serving and we promise to bring some fun to the party. For more info and bookings contact Sue on suejames73@gmail.com or call 01482 634861 / 07544 236325. You can also visit their website here or check out their facebook page here.